Yesterday I wrote about how I agreed to send an item on behalf of each of my school aged children for the Pink Shirt Day inspired Bake Sale. I sent the Jell – O Magic Mousse cups which was an idea that came easily but I found myself at a loose ends trying to come up with another idea. I will confess that I am a Pinterest newbie and until this request had come up hadn’t even peeked at it but an assist from a friend off of Facebook gave me a few pink recipes to choose from. 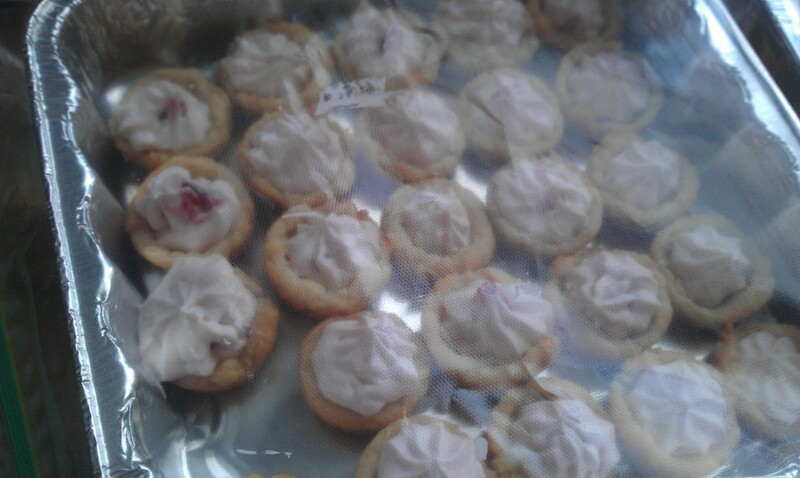 I decided to go with Strawberry Mousse Sugar Cookie Cups. I liked the look, that it used my favourite mini muffin pan, filled the nut free requirement and most of all would be easy for transport. While I looked it over I did consider that it would be a small bite that kids might not pick over larger cupcakes and cookies and while that did happen when my son gave some away at the end of the day the reviews were positive so I’ll take it. 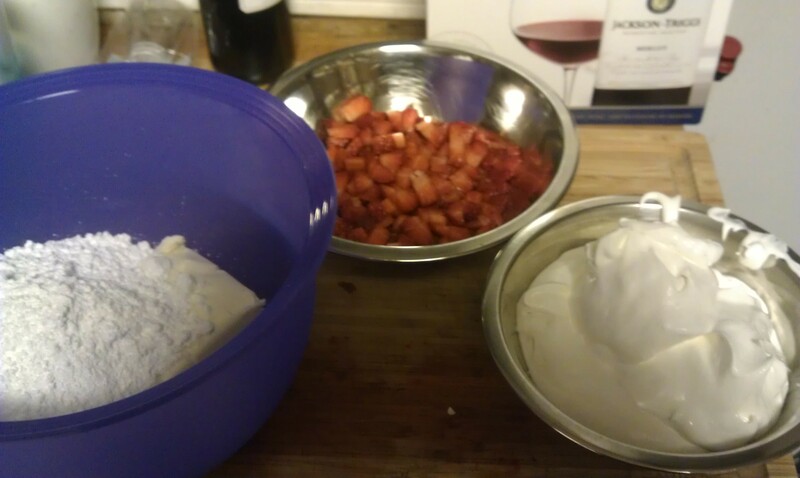 Starting left: Softened cream cheese and powdered sugar, chopped strawberries, and whipped topping. Again I liked that this was a simple recipe. I’ve never made a mousse before and the fact that this wasn’t overly complicated with pretty familiar ingredients made me confident I could make this come together with good results. I will say that I debated with myself while chopping the strawberries if the pieces should be smaller. Turns out that they could have been but it wasn’t a show stopper. The mousse with all the ingredients combined. 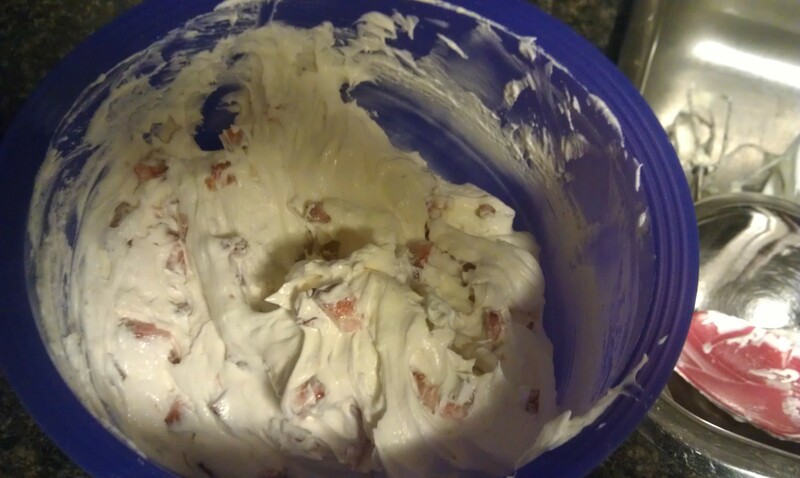 I will say that as I was working the ingredients together I found that even with the softened cream cheese and my Kitchen Aid mixer that when I went to fold the strawberries in that it took a bit of work and I was very worried about loosing some fluff in my mousse. After all when you think about mousse you think of something light and fluffy. Turns out that it worked out well in the end despite my concerns. After having my mousse combined I put a lid on it and tucked it in the fridge for the 2 hour resting period. Taking advantage of the 2 hour rest period I turned my attention to my attention to my sugar cookie cups. 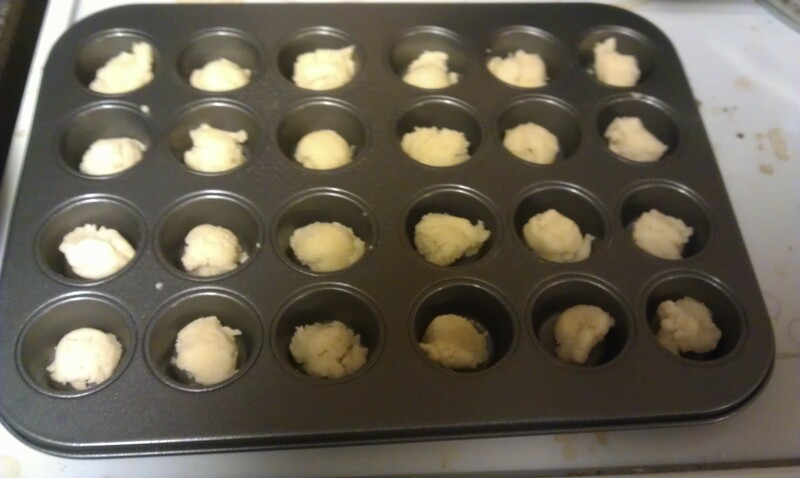 Mini muffin pan ready to bake the sugar cookie cups. Now the author of this recipe used a tube of sugar cookie dough but I couldn’t find one at my neighborhood IGA so I wen with Betty Crocker’s Sugar Cookie Mix. Betty Crocker’s mixes are nut free I’ve found and work in a pinch when you need it. My first batch of cups were a bit lean as I wasn’t sure how much dough to use in the cups. My second batch turned out much better as I was a bit freer with the dough. They went into the oven and were done in 8 minutes. 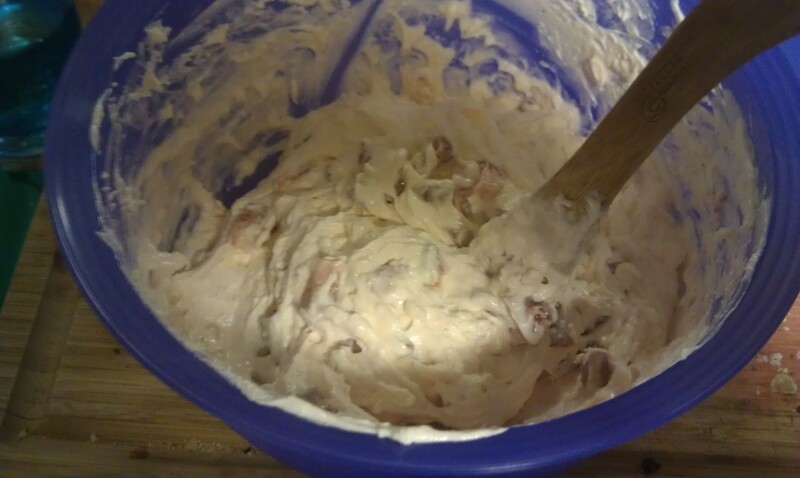 I skipped the white chocolate chips after baking because I couldn’t find some I was sure would be nut free. Finished cookie cup out of the pan. I wasn’t sure how the cup would be formed when I pulled the pan out of the oven. 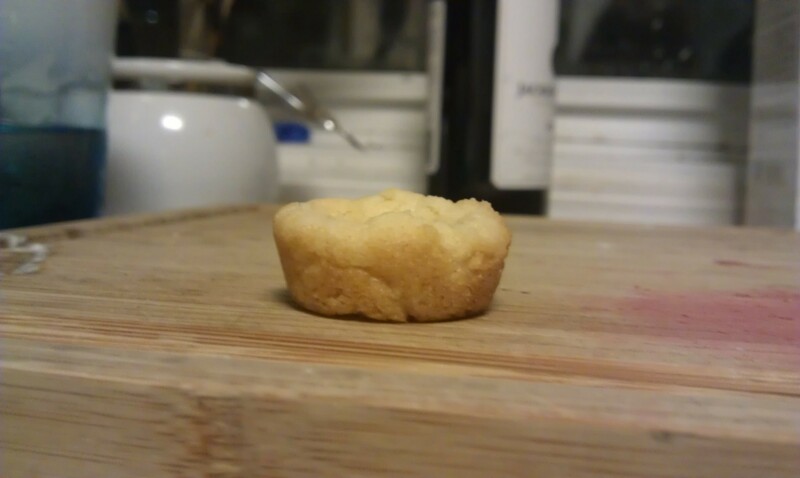 I had what looked like small cookies but as they cooled the centre sunk down and made the cup happen. As you can see not perfect but still very tasty. The mousse two hours machine. The picture doesn’t do the mousse justice sadly. The mousse did go a really lovely shade of pink that I was very happy with. My new kitchen gadget must have. I had to borrow this one from my mom. This lovely decorator is from Tupperware and my next purchase I think. I borrowed this one from my mom’s recent Tupperware order. I’m fully in love with this one! It loads easily and dispenses just as easy. One of the issues I have with my arthritic hands is often I can’t hold a decorating gun without cramping in my hands setting in after only a matter of seconds. This easy to squeeze decorator made the task go quickly and I am converted to it. Finished bites! Packed and ready to go. I used the large star tip and filled my cups until I had what I thought was a good amount of mousse in each cups. I still have left over mousse in the fridge. 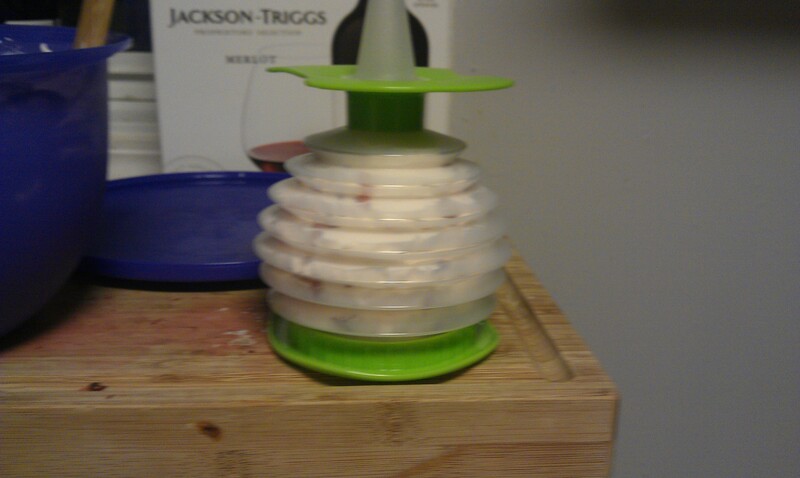 I’m planning to use it this weekend for Strawberry Mousse shots for a friend’s house party. Posted on February 28, 2013 by Shirley Robert	• This entry was posted in Cooking with Kids, Recipes and tagged bake sale, cream cheese, dessert, dough, food, kitchen aid mixer, mini muffin pan, nut free, powdered sugar, softened cream cheese, strawberries, strawberry mousse, sugar cookie, Tupperware, whipped topping. Bookmark the permalink.